When Is It Too Late For Asphalt Parking Lot Sealcoating? You may have heard that September is the last month to have parking lot sealcoating done prior to winter, but this isn’t necessarily true. While September is more ideal, successful parking lot sealcoating can typically be completed through to at least mid-October (sometimes, depending on weather, even through to the end of October). The exact end to sealcoating season is determined each year by current weather patterns, but it’s safe to say that until mid-October we are still in the “safe” zone. As we get closer to the end of October, we will need to be more selective and take more precaution (especially in shady areas and other areas of pavement likely to be cooler). Typically, when nighttime temperatures consistently fall below 40 degrees F, sealer’s curing process can be hindered. The last week of October, into the early weeks of November is usually where we start seeing these temperatures. It is important to understand that parking lot sealcoating dry time and cure time are two different things completely. Dry time refers to when the asphalt sealer is dry enough to walk or drive on, but cure time refers to molecules fusing together (this cure process occurs over a 30-day period). When temperatures dip below 32 degrees, this curing process is interrupted and does not resume. Because the sealer was not given proper time to fully cure, premature wearing is very likely. Additionally, when temperatures are lower, the ground is colder which means this curing process may take longer. For these reasons, summer is the best time for sealcoating. Temperatures – As mentioned above, temperatures play a huge role in determining if a sealer application is successful or not. Temperatures should be 50 degrees F and rising. Daylight – As we get deeper into fall, the days become shorter. This means number of working hours decreases. An early start allows for ample drying time during afternoon hours. Shady Areas – Shady areas during fall need to be paid attention to more so than usual, because with cooler temperatures, sun hours are crucial in drying. Sealing in these areas should be completed just before the sun typically hits it so it has about 2+ hours of afternoon sunlight. If there are certain areas that do not see sun at all, the ground in these areas will need to be above 50 degrees for proper application to occur. Humidity – If humidity is expected to be 90%, this means that only 10% of the air is available for evaporation, meaning that water removal will be hindered. Water removal is facilitated at a much higher rate when the humidity is lower. Parking lot sealcoating is an important maintenance practice to complete prior to winter to create a protective layer that helps to guard your pavement from the damaging effects of winter (like frost heave, salt, plowing, and winter potholes). 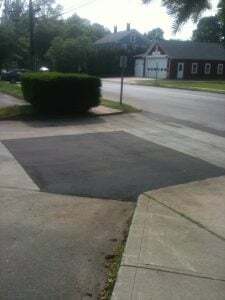 Asphalt sealer is most effective when paired with other asphalt repair like crack filling and pothole patching. Actually, fall is the best time for crack filling! Only sealcoating a cracked and broken pavement surface will have less than desirable results. As we head into the beginning of fall, it is not too late for your parking lot sealcoating project! Contact EastCoat Pavement today for your free asphalt sealer consultation!